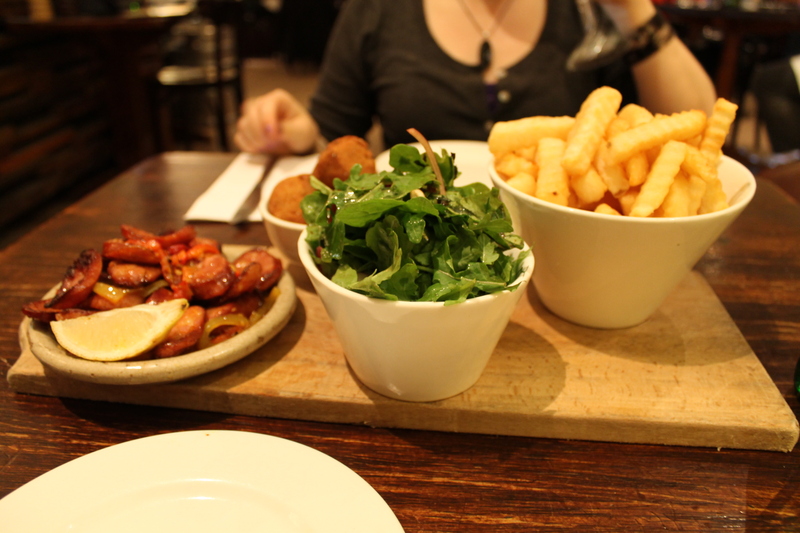 There are many many many people in the world who will tell you that the food in Tasmania is amazing. Food critics rave about the local produce, the restaurants and the coffee. My experience with the food in Tassie is that it is bloody brilliant! Honestly it’s some of the best food I’ve ever had and it was very reasonably priced, and everywhere we went was good and I feel spoiled having been able to experience it. As I mentioned in my last post I have pictures! So here goes; some food photos to make you hungry. To start with we have the first breakfast of the trip, at a café called Zum in Salamanca Place in Hobart. 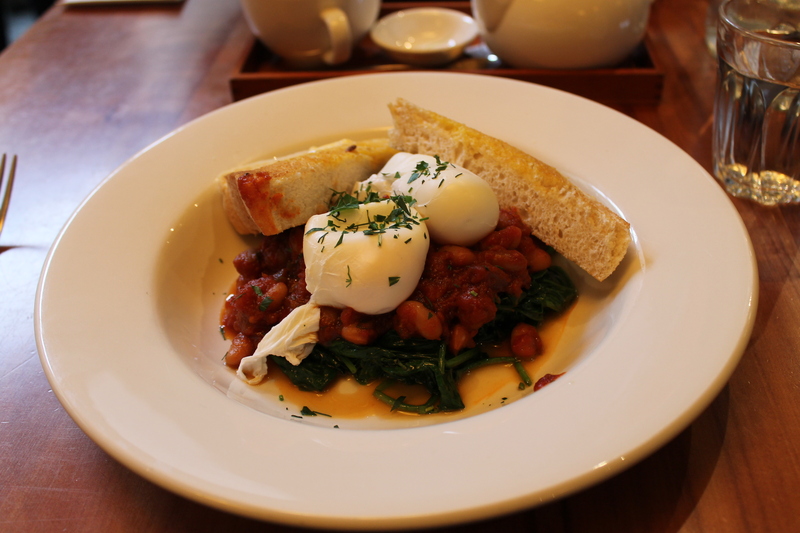 I had the Italian beans with eggs and toast, it was delicious. 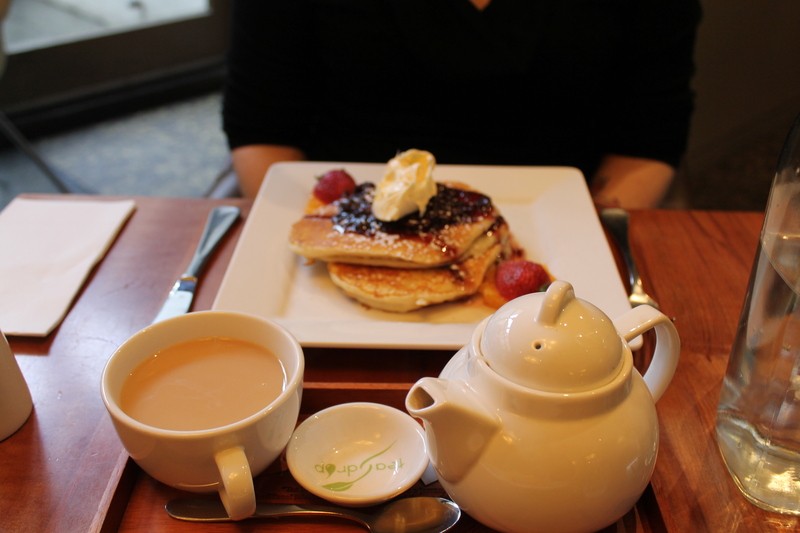 Louise had the ricotta pancakes with mixed berry sauce and King Island cream, also delicious and very rich! For dinner the next night we went to a place called Rain Check Lounge in North Hobart after having seen Shame at the State Theatre (cinema) across the road. What you see here is falafel balls with mint yogurt, chorizo with lemon wedge, gorgeous green salad and chips with wasabi mayo. So very very tasty. The lounge also had a really gorgeous interior feel; laid back and hip but not in a try hard way, there is a photo of the wall that will appear in a later post to demonstrate. 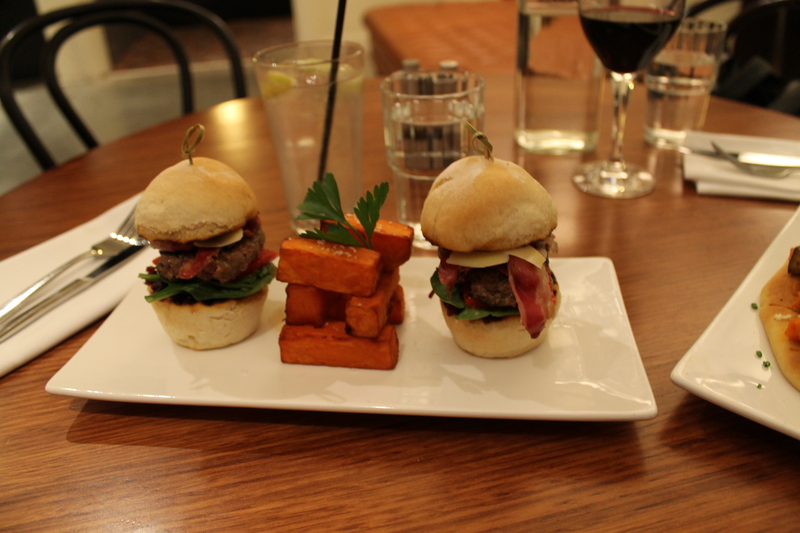 Here we have mini lamb burgers with sweet potato chips. This was at the Brunswick Hotel in central Hobart (we also stayed here in their hostel, it was one of my best hostel experiences ever). The flavours were subtle and lovely, the sweet potato chips were both chippy and gourmet-y therefore satisfying the food snob and the bogan within me. 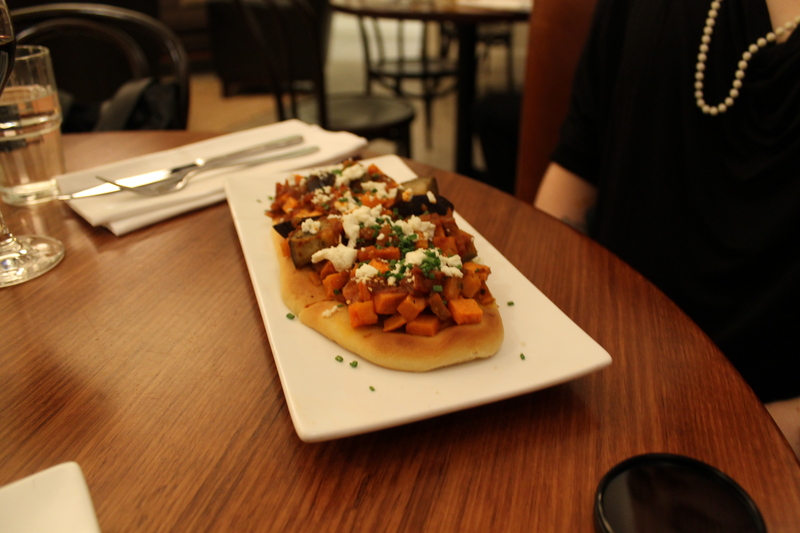 Louise had this open Turkish bread pizza thing with ricotta (I think), eggplant, sweet potato and a tomato-y sauce but the photo of that isn’t very good. The meal however was super tasty. The interior of the restaurant was also cool, photos of that to feature in a later post. 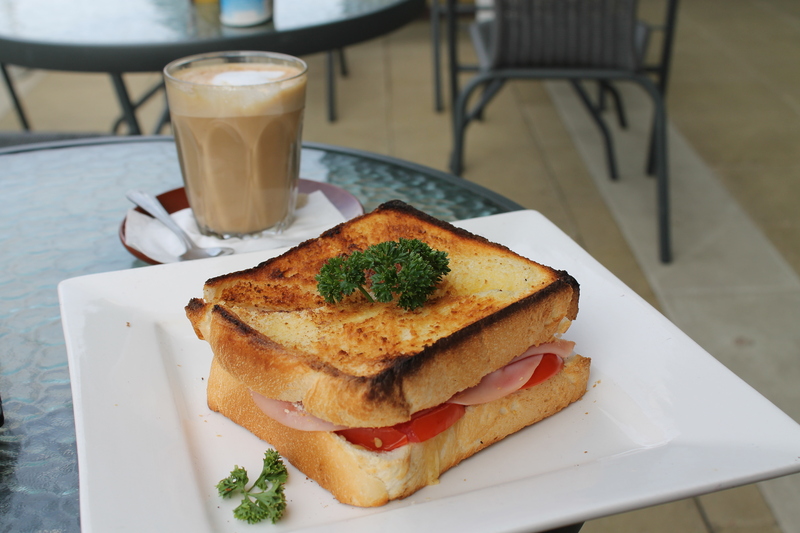 The last meal I am going to put up is the ham, cheese and tomato toasted sandwich that I had at a place called the Larder in Devonport. The Larder is one of those places that don’t spend too much time on interior design, they have a clean, simple look and they focus on good quality food for very reasonable prices. This is possibly the largest toastie I’ve ever seen, served with a cute retro parsley garnish and lovely coffee. Apparently this is one of Jennifer’s favourite places to go in Devonport. The people who ran the place seemed very down to earth people who seemed to have a genuine love of what they did. Getting that sort of love of your work in Melbourne is pretty rare. Now for the produce; on Monday we drove down to Grandvewe sheep’s milk cheesery. The drive was just less than an hour south of Hobart to Birch’s Bay. The farm is certified organic, the view is gorgeous looking out over the ocean, the sheep looked very happy pottering around the farm. 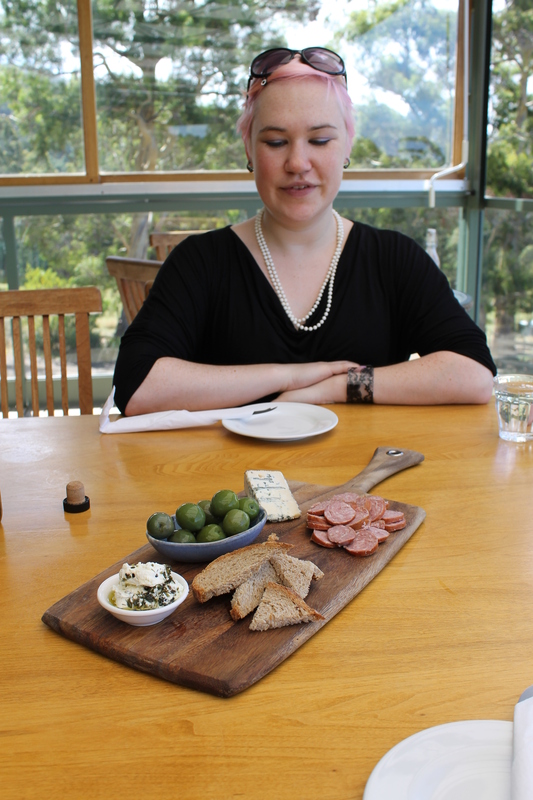 What you see here is the platter we ordered; a white ricotta-like cheese in a lemon thyme oil, green olives, warm sourdough bread, mutton sausage and blue vein cheese. 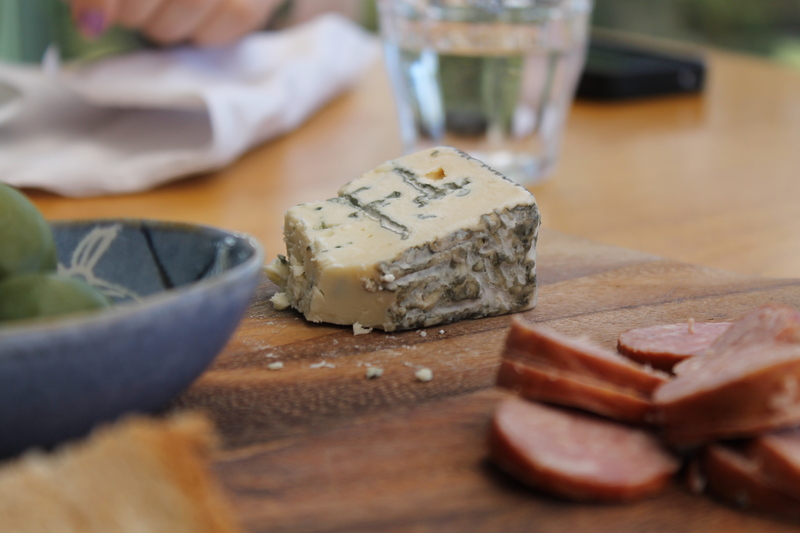 This is the blue cheese closer up (after we’d eaten some). The cheese was really smooth and intensely flavoured. The sheep’s milk is apparently more suitable for people who can’t have cow’s milk, so I brought some home for my mum to try. I highly recommend if you get the opportunity to try sheep’s milk cheese that you give it a go. On the Saturday Louise and I spent the morning at the Salamanca Market. These markets are about 300 stalls, mostly local produce and crafts, lots of really gorgeous people running the stands, with a view across the harbour. 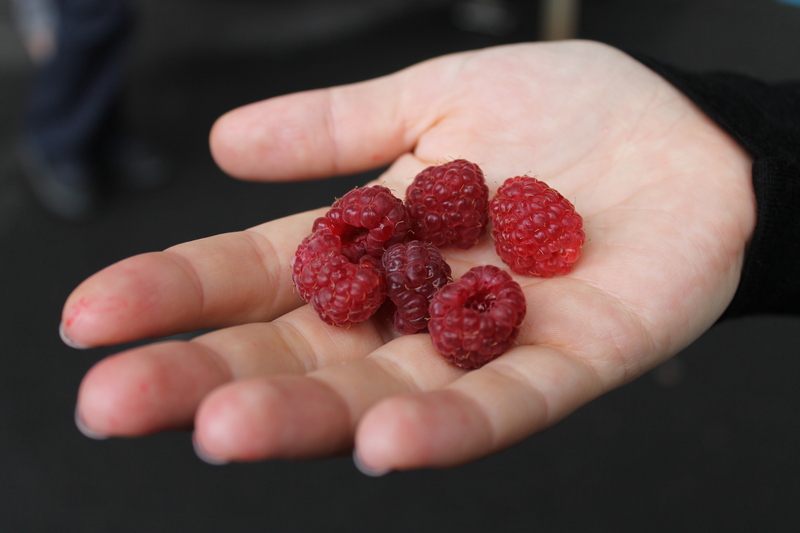 You see here possibly the best raspberries I’ve ever eaten! They were creamy in texture, bold in flavour, their colour was gorgeous, and it was an eating experience I doubt I will have again. I don’t know what the farmer did to make them so amazing, maybe he watered them with his own tears, because seriously they were magic. Also while we were at the markets we saw some filming of Master Chef (it’s a reality TV show where people compete to become chefs as the name suggests). There were four teams of amateur chefs cooking and serving different dishes to the market-goers. I believe the idea is to see who makes the most money and declare that team the winner. There was a hive of activity around the stands but mostly it was people with their phones out taking pictures, not a lot of buying happening. I got this photo a bit later having pursued the hosts of the show to a spot slightly away from the throng. 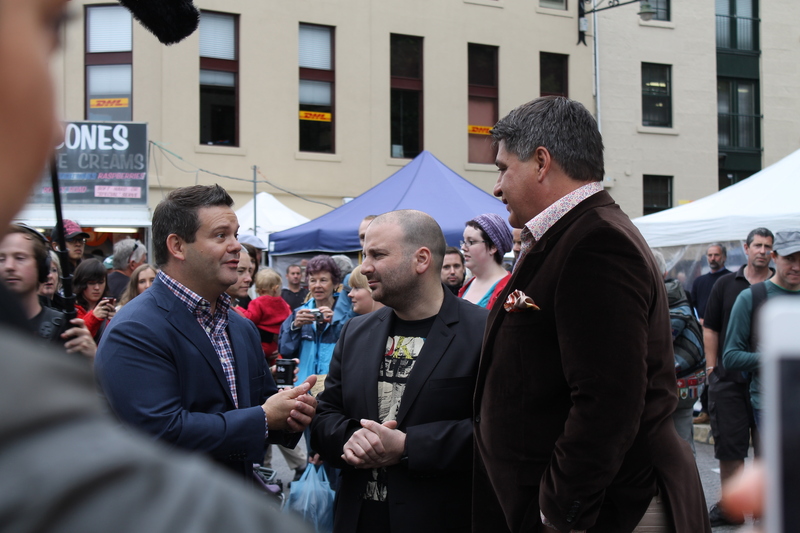 Pictured are Gary Mehigan, George Calombarus and Matt Preston; Gary and George are Melbourne based chefs/restaurateurs, Matt is a food critic. You can see from the picture that Matt is a giant of a man, and to be honest he’s my favourite (I may also have a secret celeb crush on him). While not an avid fan of the show, I did get excited to see them all there. Interestingly I was one of the very few people among the crowd taking pictures who was not doing so on their phone. It made me feel like a proper paparazzo! It was pretty cool. During the trip we also visited a number of other producers; Ashgrove Cheese Farm, Christmas Hills Raspberry Farm, the Tasmanian Gourmet Sauce Company, The Honey Farm, the Cadbury Chocolate factory, the House of Anvers Chocolaterie, the Cascade Brewery and the Boag’s Brewery. Photos from some of these places will be featured in blogs to come. The week in Tasmania was a week of some of the best food I have ever had. People who say Tassie is backwards or not up to scratch in terms of dining and good produce clearly have never been there. I think it’s definitely an experience that Australians (if not everyone) should have in their lifetime.